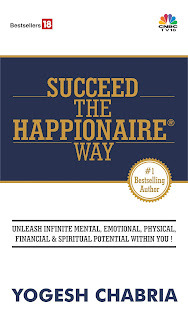 Yogesh Chabria - The Happionaire ​Blog - Best Motivational Speakers In India - Inspiration, Success: What's Your Take On Ideas? What's Your Take On Ideas? I have always believed in the power of ideas. I have believed ideas can change life, provided they are backed by complete faith and action. As I consider you a friend, I thought of sharing a recent video of a seminar we did in Dubai. It's on the power of ideas and how a gentleman created $20 million by taking action. You can click here to view in on Youtube. I'm curious to know what is your take on ideas, there power and what are some of the most powerful ideas that have had an impact on your life? I'm curious to learn. I'm also curious to know what are some ideas you are working on for the future?